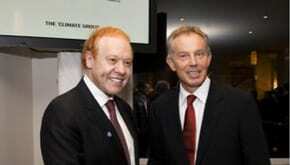 Visy chief Anthony Pratt is promoting a speaking tour featuring former British PM Tony Blair. Tony Blair will visit 5 cities in 3 days when he visits Australia and New Zealand in July to share his insights on leadership, negotiation and innovation. From lunch in Melbourne on Wednesday 27 July , to lunch in Auckland and dinner in Brisbane on Thursday 28 July and lunch in Sydney and dinner in Perth on Friday 29 July the views of the British Prime Minister from 1997 to 2007 on the world today and the global issues facing the planet will be shared with thousands of Australasia’s business leaders. In his role as the Quartet Representative for the USA, Russia, UN and EU he helps facilitate the Middle East peace process. Through the work of his Faith Foundation he promotes respect and understanding between the major religions while making the case for faith as a force for good in the modern world. Through the projects of his Africa Governance Initiative in Rwanda, Sierra Leone and Liberia Tony Blair advises President Kagame, President Koroma and President Johnson Sirleaf respectively on policy delivery and attracting investment, alongside a team of his staff working full-time in all three countries. Mr Blair’s memoir, “A Journey: My Political Life” was released in September 2010 and made the New York Times Best-seller List within a week of its release.